This post will prove the point that one picture is worth a 1000 (or whatever number) of words. 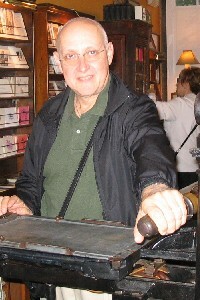 Jonathan Feinberg, a senior software engineer at IBM developed the “Wordle” as he calls it, as a “toy” as he describes it. In fact the “Wordle” is a unique communication analysis tool which is perfectly suited for the contemporary environment. Most every savvy internet user knows about “tag clouds” – there is one associated with this blog. It provides a visual explication of the global content of this blog by establishing the emphasis of the blog in terms of topics covered, shown by the varying size of keywords used. As I understand the Feinberg invention, “Wordle” takes this a step further, by graphically distributing a word array of any text feed into it. Tonight, with CNN using what I assume was “Wordle” technology to analyze President Obama’s nationally televised News Conference, in my opinion, “Wordle” comes of age – and in fact – changed its age; it’s now appropriate for use by those of any age desirous of “seeing” what someone is saying, writing, etc. In the process of using such an evaluative tool, we come to “see” what the communicator is trying to communicate. Pretty neat and a pretty significant advance for the field of communications Mr. Feinberg. We thank you.